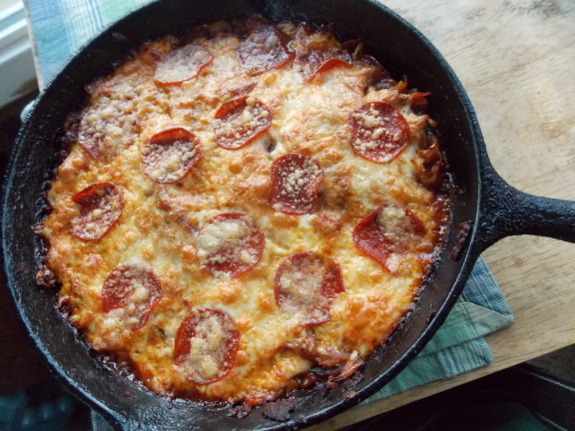 I liked Jennifer's recipe a lot, but even with the bacon, it just barely made the cut for Mark, so I moved on to the Cabbage Pizza Skillet that another reader recommended. (Bonus that this one is a full meal rather than just a side dish!) Cabbage Pizza Skillet will definitely merit multiple repeats since Mark and I are always looking for grain-free dishes that push those pizza buttons. I'd say this one might be a little closer to lasagna than to pizza, but it tastes great! Expect it to feed four hungry people. For some reason I'm having a hard time commenting! Our favorite is cabbage, optional onion, and kielbasa (or some other sausage). We used to add noodles, but we don't eat them any more. It's a complete, filling dinner, and easy! Thanks for the shout-out! If you try it, I hope you really enjoy it. My mom actually just suggested yesterday that I try it in a crock pot as part of our Christmas dinner, so I think it's worth a try to cook in the Dutch oven! You really could cook it until your desired consistency, so it could be an easy recipe to play around with. And I love the comment about kielbasa or sausage. I think my family's recipe would go really well with that addition, to create a full meal. Best of luck! This post is making me very hungry. I'm going to try the pizza and roasted cabbage recipes. We make something very similar to the top recipe from Jennifer except we use carrots and onions cooked for a few minutes in butter then add the cabbage and some green pepper. I'm going to try it with bacon next time as my grandkids LOVE bacon. Also we just killed a hog so I should have some bacon ready soon! I usually put a metal bowl or even another pan over my frying pan since it looks like it will overflow to start with, but cooks down pretty quickly. Yum, yum, yum. 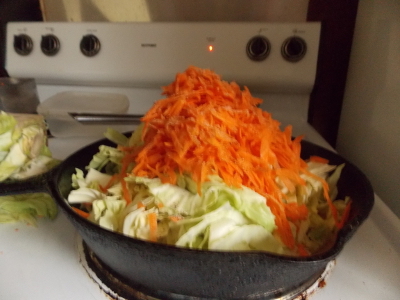 I found Krautflecken, or cabbage toss, made as in comment one, with noodles, onion, and carrot slices, in a compilation of Pennsylvania German recipes. Try with grated nutmeg, it''s great. I have been cooking a Cabbage and Apple Fry for the past few years. I use 1/2 head cabbage and one tart apple (granny smith is real good) The internet recipes suggest Caraway Seed for seasoning along with salt and pepper to taste. Heat oil in pan and toast seeds; add shredded cabbage and sliced apple and toss until crisp fried. Your pizza was interesting. About all the cabbage taste was sublimated to the pepperoni and the sauce. I will be eating it again.